Mexico is easily the fastest-growing online gambling market in Latin America. Which is surprising due to their outdated gambling laws and regulation. Though the industry was valued at approximately $300 million last year and is expected to grow substantially, it is more targeted toward wealthy foreigners - not the locals. Many tend to turn toward alternate international sportsbooks where Mexican gaming laws don’t apply and will accept wagers from Mexican players. 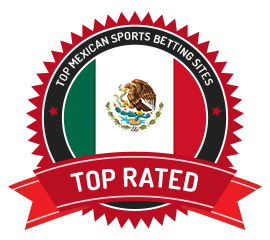 Currently, there are over 476 online sportsbooks that accept players from Mexico, and 99 of which have Spanish-supported software. Though sports betting in Mexico has been legal for over a decade, it was only recently that Mexican sportsbook industry evolved and became regulated and legal. Majority of sports betting in Mexico that took place in the 1990’s was illegal. Today, players are able to bet on various sporting events online using sportsbooks. The largest online sportsbook in Mexico is on the Caliente Casino website which runs over 50 betting shops across Mexico and accepts bets online and by telephone. Caliente’s interface is in Spanish and has many international sports to bet on. Their site heavily favours soccer, but they also have options to bet on the NFL, NBA, NCAA sports, Baseball and even NHL games. Their Tijuana parlour is very popular with international travellers, especially American clients who cross the border. Which isn’t surprising since they feature so many American sporting events. Americans actually make up approximately 15% of Caliente’s net profits. As stated above, there are hundreds of online betting sites that will accept Mexican players as well as plenty of sites that can be translated to Spanish. Some sportsbooks even support the Mexican peso and allow easier deposit methods for their players. Due to the gambling limitations in Mexico, it is safe to say that Caliente Casino is the only legitimate sports betting site within the Mexican borders. With the options for players to branch out and use international sportsbooks, it would be wise to do some research and pick the sportsbook that best suits their needs and more importantly, accepts pesos and has Spanish language support. When choosing an international gambling site, you must ensure they have their gaming license and a reputable brand. Once you’ve selected a sportsbook, you will need to make a deposit to get started. The good news is that Mexico gaming websites accept peso deposits and allow you to maintain your balance in pesos. However, since the Mexican sites are not targeted towards locals, you must place your bets in either EUR, USD or GBP. Any winnings you receive will be converted back into pesos. International sites accept various credit cards, pre-paid visas and money transfers. Some Mexican-friendly sites actually accept deposit methods such as Todito Cash and DineroMall among others.